When timing is off in your computer, specific events don’t occur in the right order. But if you know the physics and i–v relationships of resistors and capacitors, you can create a circuit that detects pulses; then when a pulse is missing, the circuit can trigger an alarm notifying the user of a timing problem. A digital system is controlled by a rectangular clock waveform serving as a standard timing reference. You can model a single rectangular pulse vS(t) as the sum of two step functions, where one of the step functions is delayed and inverted, as you see in the following figure. 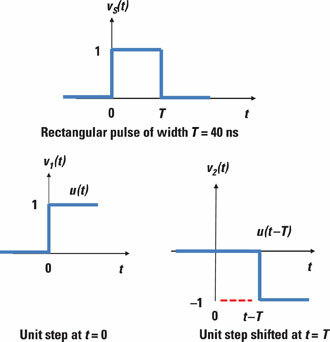 VA is the amplitude, which equals 5 volts, u(t) is a step input starting at time t = 0, and u(t – T) is a delayed step function starting at T = 40 nanoseconds. The rectangular waveform serves as an input to the digital device modeled by the following circuit. The output v(t) will detect the clock pulse if v(t) exceeds the logic 1 threshold level of 3.80 volts. Determine the equation for the zero-state response v0. VA is the amplitude of a step input, and RC is the time constant with R as the resistor value and C as the capacitor value. Determine the response due to the positive step input applied at t = 0. Determine the response due to the negative step input applied at t = 40 ns. Find the total response vO(t). The following figure shows that the total response at t = 40 ns is vO(40 ns) = 4.32 V. For this example, the circuit will detect the clock pulse because the total response reaches a maximum of 4.32 volts, exceeding the threshold of 3.8 volts. 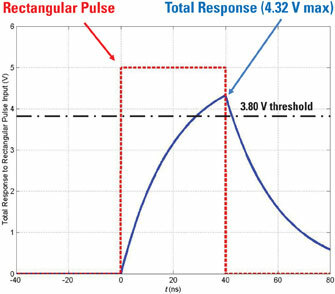 If the pulse width is narrowed down to 1 time constant, or 20 nanoseconds, the total response would reach a maximum of 3.16 volts, which is less than 3.8 volts. In that case, the pulse clock wouldn’t be detected.